311 (pronounced "three-eleven") is an American rock band from Omaha, Nebraska. 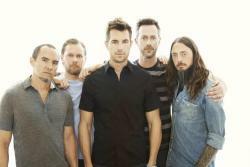 The band was formed in 1988 by vocalist/guitarist Nick Hexum, lead guitarist Jim Watson (who would later be replaced by Tim Mahoney), bassist Aaron "P-Nut" Wills and drummer Chad Sexton. In 1992, Doug "SA" Martinez joined to sing and provide turntables for 311's later albums, rounding out the current line-up. The band's name originates from the police code for indecent exposure in Omaha, Nebraska, after the original guitarist for the band was arrested for streaking. To date, 311 has released eleven studio albums, two live albums, four compilation albums, four EPs and four DVDs. After a series of independent releases, 311 was signed to Capricorn Records in 1992 and released the albums Music (1993) and Grassroots (1994) to moderate success. They achieved greater success with their 1995 triple platinum self-titled album, which reached No. 12 on the Billboard 200 on the strength of the singles"Down" and "All Mixed Up", the former of which topped the Billboard Hot Modern Rock Tracks in 1996. The band's next three albums, Transistor (1997), Soundsystem (1999) and From Chaos (2001), did not achieve the massive success of the self-titled album, though they were still successful, with the first going platinum and the last two going gold. Their 2004 compilation album Greatest Hits '93�'03 was also certified gold. The band's most recent studio album is 2014's Stereolithic. As of 2011, 311 has sold over 8.5 million records in the US.